1. Make sure you have at least version 3.2.1 as it contains some performance improvements that will speed up the sync process. You can upgrade to the latest version through the App Store. 2. Make sure your device is connected to a wifi network (the faster your connection the better). 3. 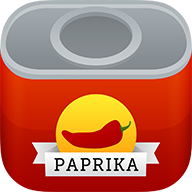 Go to Paprika's Settings -> Cloud Sync and press the Sync Now button. This initiates a full sync. 4. Plug your device into a charger so it does not turn off or go to sleep. 5. Let the app keep syncing until the indicator shows that the sync has completed.